Keen Chat is an instant messaging interface similar to other live communication applications used across the Internet. It allows real-time conversation between two users of Keen. Once a chat has been initiated, either user can enter text, which will then appear on the other user's monitor. Keen uses your browser, and does not need any special software or downloads. Your browser (and any toolbars you may have enabled) must allow pop-ups from Keen.com. 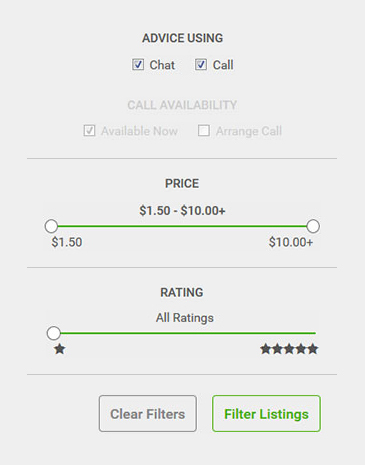 There are many ways in which you can discover advisors who offer chat; the simplest is to visit any topic of interest on Keen and uncheck the "Call" filter, then select "Filter Listings." Each advisor sets their listing rates on Keen. The rate is the same for calls and chat. Yes, please review the Keen Chat Policy. It’s easy – we do it the same way as calls! If you have any free minutes with the advisor, those are used first. Then you can add money to your Keen account, and use those funds to pay the advisor's per-minute rate. Keen will display an alert when you have one minute remaining. Once your funds are exhausted, the session will pause while you replenish your account, after which the session will resume. You can end your session at any time by clicking the "End Chat" button. The cost of the chat session will be deducted from the balance of your Keen account. Is Keen Chat available outside of the US? Yes, it sure is. Please review the list of countries where Keen is currently available to see if your country is listed. What are the supported languages by Keen Chat? Keen Chat does not translate into any other language. The words (language) you type will be exactly what the advisor will see. Should you and the advisor both speak Spanish, or French, or another language, feel free to converse in that language. The Keen Chat system supports all languages as long as both you and the advisor have the appropriate language packs installed on your computers. We want every experience on Keen to be satisfactory. If it isn't, please let us know by contacting Customer Support.